As I was reading Timothy George on Calvin he made reference to his famous extra Calvinisticum doctrine. Extra Calvinisticum is Latin for “Calvin’s doctrine of the outer/beyond.” It means that during his earthly life, the Son of God retained existence outside his earthly body. He remained infinite while becoming finite: he remained omnipresent while becoming localized. Think of it like this: was the second member of the Trinity, the eternal Word of God, God the Son – was he still “sustaining all things by his powerful word” (Heb. 1:3, cf. Col. 1:15) in the year 15 AD? Calvin (with Athanasius) answers yes, and therefore he must still have been omnipresent and fully divine: that is the extra-Calvinisticum. I’ll never forget going over this in my Christ and Salvation class with Dr. Peterson. There were two problems that sprang up in my mind: first, is this irrational? How does it not violate the law of non-contradiction to say that Christ was both finite and infinite, both localized and omnipresent? Second, does this square with with orthodox, Chalcedonian Christology? Does positing a local, human Christ and an omnipresent, divine Christ lead to the old Nestorian error of having two separate Christs? 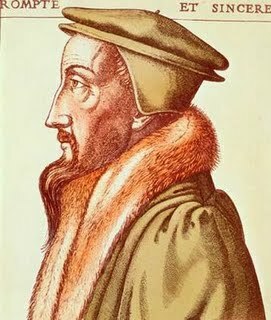 Are Calvin and Athanasius substituting the orthodox Christ of one person with two natures for the heretical Christ of two people with two natures? After going over this in class I thought about all the rest of the day, and the next day, until I arrived upon a consideration that seemed to me to absolve both of these problems simultaneously. I was once again reminded of Barth’s language that heaven and earth are infinitely, qualitatively distinct. “Heaven” and “earth” are not two different places in the same realm, like St. Louis and Nashville are two different places in the same realm. They are, rather, altogether different realms. It would be irrational (and possibly Nestorian) to posit that the human body of Christ was literally and actually in both Jerusalem and Bethlehem at the same time in the year 15 AD. However, “Jerusalem and Bethlehem” do not correspond to “heaven and earth.” There is not a one to one correspondence between heaven and earth: they are infinitely, qualitatively distinct. Therefore Christ is able to be fully localized on earth and remain “extra” just as Tolkien could have written himself into the story of the Lord of the Rings (thus having the properties of a character in that story) while still remaining in Oxford (thus retaining his original properties). Tolkien could not have traveled to Cambridge while remaining in Oxford; but he could have written himself into Middle Earth while remaining in Oxford. That is because Middle Earth and Oxford are not just different places, like Oxford and Cambridge, but different realms. In the same, mysteriously and wonderfully, the Logos is able to become fully man on earth while remaining fully God in heaven: one person with two natures; to use the language I have been using here, one person in two different realms. But how is this possible? As Barth says elsewhere, “actuality entails possibility.” Because Christ did become fully God and fully man in one person, it must be possible. Of course, being a part of earth and not heaven, we are not in a position to say how it is possible – anymore than Frodo and Aragorn and Gandalf can sit around talking about Tolkien and Oxford unless Tolkien enables them. But because Christ has been revealed to us in history, the Bible, and the Spirit’s work in our hearts as God, then we know that it is possible. Whatever happens is possible. This is a great post. It seems to me that, in addition to your spatial reflection, the temporal dimension leads in the same direction: since Heaven is “outside” normal time in eternity, it makes no sense to claim that Heaven was vacant of the second person of the Trinity from BC3-AD 30 – since those categories of time don’t apply. I agree, Eric: you could say He became temporal while remaining eternal. Thanks, a good addition.